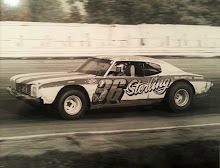 Fairbury, Ill. (July 5, 1975) - Dave Feese of Saybrook took the lead on the fourth lap from his hometown racing rival, Terry Pearson, and then held off the challenges of Tom Myers of Pontiac for the remaining 21 laps to win his second feature of the year at the Fairbury Speedway. Feese, who pilots a 1972 Chevelle with a 350 cubic engine, that was built by Butch Hixon of Gibson City, did an excellent job of driving. Myers was right on his bumper at all times, just waiting for Feese to make a mistake, but he drove a near flawless race. 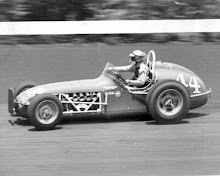 Terry Pearson held on to third, Joe Cleary of Odell was fourth, Jack Wissmiller of Lexington was fifth, Jerry Roberts was sixth, Rich Sanders of Forrest was seventh, Ed Bolen with eighth, Jack Tyne was ninth, and Jerry Reeder was tenth. Roberts turned fast time for the eight-cylinders with a time of 15.99 seconds. Then starting on the pole in the trophy dash, Roberts ran away from the field to win in a record time of 1 minute and 35 seconds. 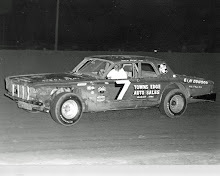 Tom Myers finished second and Jack Tyne third. Dave Pleines of Arrowsmith won the first 10-lap heat in a close battle with Gerry Reeder of Peoria. Mick Branz was third. Terry Pearson beat Dave Feese and Jerry Roberts in the second heat. Eldon Norrick of Watseka won the third heat. 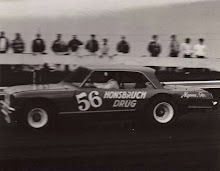 Bobby Nagel and Reggie Weller trailed Norrick. Pleines became a double winner as he outdistanced Branz and Rick Scharp in the consolation. 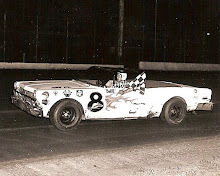 In six-cylinder competition, Sammy Lee won his fourth feature in five tries this season. Ron Starks chased Lee all the way, but when Sammy Lee gets the “Green Weenie” out in front, it is mighty hard to get by him. Bobby Shell of Clifton was third, Les Peterson of Macon was fourth, and Rich Harlan was fifth. Bohm beat Jim Wright and George Aimone in the third heat. Bohm also won the consolation, beating Al Miller and Wright.